You'll love this classic yet tastefully modern cabin. Clean and comfortable with commanding views of the Olympic Mountains. Perfect blend of modern and rustic with high/vaulted ceiling, wagon wheel chandelier and large wood burning fireplace. The cabin is situated overlooking a natural 1/2 acre pond among lush lupine meadows. Enjoy a private swimming pool (seasonal) and a year round hot tub. 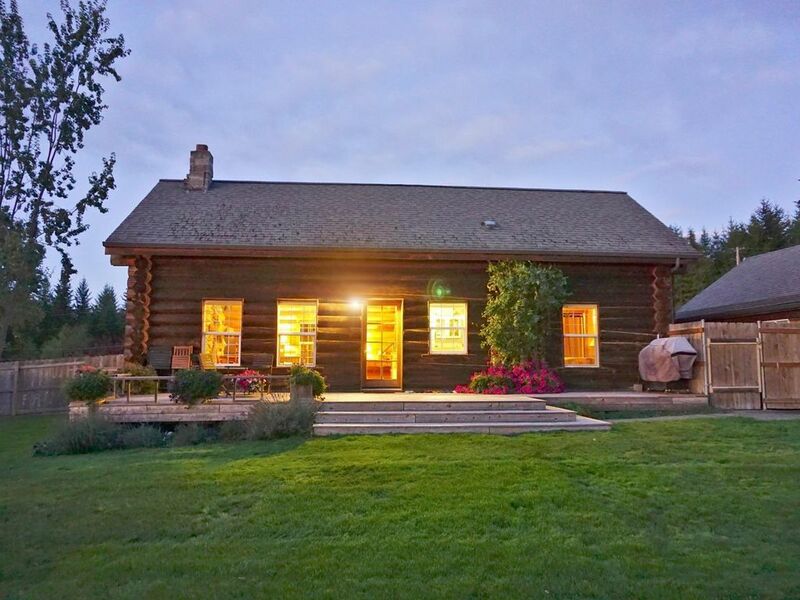 Inside this charming log cabin you will find a gorgeous rock fireplace with large hearth, where you can sit with a good book or curl up on the cozy couch-lounge. The kitchen has a full gas stove and oven, microwave and all the amenities for good cooking and eating, including staples and spices and many food staples. The downstairs bedroom has a queen, foam-pillow-top bed with fine linens and quilts and an adjacent bathroom with shower. In the upstairs loft there is a bedroom with a queen, foam-pillow-top bed and two single beds, a vanity/sink and toilet. Watch as the Bald Eagles and Blue Herons fish the pond or fish for yourself from the dock (fishing gear provided). Enjoy strolling through the Lupine meadows or walking the trails. Bicycles provided for you to ride the trails and quiet scenic roads (Olympic Discovery Trail is nearby and provides wonderful, long, scenic rides). Within 20 minutes you can venture into the moss covered rain forest, enjoy a pristine glacier carved lake, hike hundreds of miles of wilderness trails with crystal clear rivers and majestic waterfalls, be awed by the sandy rugged beaches, and soak in natural hot springs. Whether you are a nature lover who likes to kayak, surf, fish, spot birds, watch whales, bike or hike trails, or someone who is in search of a perfect quiet natural setting, you will find your heart's desire. The owners are easily available for questions, suggestions and anything you want but they leave you completely on your own unless you need something. Suzann and Martin are the owners and full-time managers of Olympic View Cabins. We had a vision for over 30 years of a family compound where we could live and share a beautiful natural environment with our son and daughter. We traveled to many places; the Pacific Rim, New Zealand and Canada in search of a special place. When we found 25 acres with a lovely pond and a truly Northwest Log Cabin 10 years ago on the Olympic Peninsula, it felt really right. We lived in the Log Cabin while we renovated the property and structures. Our son designed his Compass Rose House and we all built it together. Friends helped us build our Pond Cottage. Our son and daughter got jobs in other parts of the country so we decided to help pay for our property by renting out our homes. The Olympic Peninsula provides us remarkable natural scenery of almost every sort. We climb mountains, thrill at pristine glaciers and lakes in Olympic National Park and find bear, goats, deer and a variety of birds. We love to find waterfalls that few people have found and explore the rainforest mysteries summer and winter. Our children surf the waves as we explore the beaches with unusual pinnacles and formations, and we collect driftwood and bask on the white sand. We take our family picnicing on the beautiful clear rivers where they can catch Steelhead or Salmon. We watch the whales as they migrate, we marvel at the living glaciers. Every season of the year there is something to be inspired by and enjoy. Our specialty in life has been to enjoy and appreciate nature and to help others have that passion too. And that is witnessed in our lovely property and the beautiful homes we have blended with the natural environment. For those who want privacy, we provide it. For those who want a serene and restorative Northwest experience, we provide that. Our homes are surrounded by meadows and a pond filled with fish, with majestic trees lining the edges and wildflowers. We have tried to make nature available and enjoyable out of every window and from every deck. Our hot tubs are outside so you can view the stars. You can see the Olympic Mountains in all their array from nearly every window. We want to touch people, to leave a lasting memory of enjoyment and rejuvenation, to have an infectious experience that compels them to want to pass on the importance of our natural resources to everyone. Natural private meadows surround the Log Cabin. This Log Cabin is just steps away from Lupine Pond, a half acre wild, natural pond. none needed as summertime average is 70 degrees F. Fans provided for the few days of extra warm weather. Fine linens and quilts and plush bath towels and swimming towels. Plenty, right next to the Log Cabin. part of the one room downstairs with kitchen. French press as well as automatic coffee maker. We provide French roast coffee beans and a coffee grinder. All manner of spices, herbs, baking staples, and things to make it easy for you. good dishware, baking dishes, serving platters, trays and pool dishware too. Detailed with all cooking amenities; food processor, coffee beans and grinder, teas, cocoa, olive oil, sugar, flour, almost every herb and seasoning, mayonnaise, mustard, catsup, and more. View of the Olympic Mountains from the tasteful wood dining table. Easy access to outside dining. books about the Northwest and wildlife are available for loan while you are here. Many family games and puzzles, croquet, badminton gear and lawn games for outside. There is a spacious lawn area in the front and the back of the Log Cabin. Room to play ball or croquet. There are many places to rent kayaks or canoes. We have floats for our swimming pool only. Great skiing and snowboarding at Hurricane Ridge. There are several golf courses in the area, only a few miles away. Exclusive use for the Log Cabin guests only. Heated by a prearrangement for a charge. Olympic National Forest is a short hike away. Bass and Blue Gill fishing in Lupine Pond, some fishing gear provided. Bikes are available by pre-arrangement. Port Angeles Airport pick-up and delivery by pre-arrangement. Olympic National Park trails can be accessed by car. The property and hospitality of the owners were outstanding! We loved the open layout, cathedral ceiling and fireplace with one of most beautiful views we have ever seen! The master bed was very comfortable, loved the books, and enjoyed cooking for friends and family while we were there. It was so nice to come home to our log cabin after church, bible studies, visiting family and friends, going on walks around Salt Creek and the waterfront, and taking the Coho to Victoria where we ate the best Italian food ever! When we come back to Port Angeles, we hope to stay here again! Great place for family quality time! We spent two days just prior to Thanksgiving at this beautiful cabin and had a great time! Our goal was to getaway and have some quiet, quality time as a family. We have a two-year-old who loved exploring the outdoors. The amenities were just perfect for a relaxing time! Highly recommend staying here! It is rewarding to learn that our guests appreciate the love and care we have put into our homes and property. This appreciation encourages us to continue bringing the best possible experience to our guests while staying in one of our homes on the spectacular Olympic Peninsula. The log cabin was perfect for our family getaway! So many extra fun things that we wanted to be able to spend an entire day on the property, but already had plans for seeing the parks and trails. Watching my two kids fishing on the doc in the pond with their dad while the sun went down over the mountains was amazing. We would definitely stay again!! It is the ultimate compliment to learn that our guests appreciate the love and care we have put into our homes and property. This appreciation encourages us to continue bringing the best possible experience to our guests when staying in one of our homes on the spectacular Olympic Peninsula. We had a great stay and really enjoyed the awesome views from the back yard. The cabin is very clean and has a well stocked kitchen. A perfect place to stay if you are visiting Olympic National Park. It is the ultimate compliment to learn our guests feel the love and care we have put into our homes and into our property. We are rewarded by these lovely appreciative reviews and feel encouraged to continue bringing the best possible experience to all those guests who choose to come to one of our homes and this part of the Northwest. We stayed at the NW Style Log Cabin on a visit to the Olympic National Park. The cabin is convenient to hiking in the eastern portion of the park (Hurricane Ridge area). After a full day of hiking, the hot tub was a welcomed way to end the day. The cabin has a well stocked kitchen, plenty of towels and other amenities.Great view from the back deck and pool area. Suzann was very considerate and hospitable. We would certainly recommend the cabin to anyone visiting the area. Suzann and Martin were great hosts and pay attention to all of the details to insure your stay at the cabin is exceptional. We were only able to stay a couple of days this time, but look forward to any future opportunity to come back with our family to spend an entire week. The beautiful cabin, view of the mountains, on-site pond and pool, and the short drive into Port Angeles make this a great getaway for couples or families. I would highly recommend their property to anyone. Easy access to Olympic National Park, worlds longest sand spit, rain forest, hot springs, whale watching, ferry to Victoria, B.C. Canada, Indian reservations, tide pools, gorgeous picturesque beaches, museums and all the amenities of the Olympic Peninsula. A Multiplex Cinema is 4 miles away. We personally like to go to Lake Crescent and Marymere Falls for showing our friends a sample of the rain forest and a wonderful glacier carved lake. A visit to Hurricane Ridge is a must, even if all you want to do is park and be awed by the spectacular mountain panorama. If you want to hike from there you will find even more wonders to see and experience. Please note: A $95 turnover fee is added to to all rentals to offset the cost of pool and spa maintenance, fresh linens, firewood, supplies, housekeeping, etc.